I’ve been planning the steps to get debt free officially for four months and unofficially tossing around the idea for 8 months to a year. Here I am less than three weeks away from my debt-free plan coming to fruition and I think I’m losing my mind. OMG – less than three weeks!!!! Luckily, I think it is a normal freak out. If you were all of a sudden about to have no commitments, no debts … wouldn’t you freak out a little too? My mind is racing with all of the things I have to do in order to move (purging & selling items, changing address, finding a post office box and a storage unit, physically moving, packing & unpacking, changing insurance policies, disconnecting power / internet etc). All the while, continuing to keep my photography and travel businesses running so that I can make money to live. After all, being debt free doesn’t mean being rich or having no bills. It simply means I will have no debts hanging over my head. It means living more simply with a goal in mind to keep me on track. And, now that being debt free is within reach (week! I can’t believe I’m saying that!) I’ve started day dreaming about the possibilities for what my fall travel will look like. Of course, this is the fun part, but it can be totally overwhelming too. Pssst … I’m not sure if you know this, but there is a whole world out there waiting for you to discover it! Trying to decide where to start, what to see and what to leave out is kind of a big deal for me. And, trying to balance that with the fact that I do not want to be constantly on the move. I want to settle down for a few weeks in a couple of yet to be determined places so that I can really get a feel for that area, as well as being able to continue working as a travel agent remotely. I know for the many of you out there who are living vicariously through me and those who are incredibly excited for this journey of mine, you read all of this and say ‘you go girl’ and ‘that’s so exciting’. You are right. All of this is very exciting, but please don’t forget that it is also incredibly overwhelming. At this point I go through daily moments where I think ‘OMG what have I done?’ Don’t get me wrong, I wouldn’t take any of it back, and in fact, if I wanted to, I could kibosh the entire traveling plan, but I’m not. The ‘what have I done?’ is just me being overwhelmed with all that I’ve accomplished and all the lies ahead of me. Not in a bad way, just in a way that most people don’t understand because they’ve never set a plan in place to get debt free and travel. Sure, I am by far not the first person to do this! But, I bet for most of you I’m the first person you know who is doing this! And quite honestly, it often happens before starting your life and career or after your kids graduate and you retire. Of the small percentage of the people in the world who sell everything and go travel, I’m the even smaller percent who is doing it in the middle of my career, before I have children and long before I retire. Stupid? hmmm … I sure hope not. Will I regret it? Not a chance. Although I’m not going to go in to a lot of detail on my blog, it is true … a few weeks ago I met a lovely man, right when I least expected it. Only a couple of weeks after having decided to make my life into total renovation chaos, a caring, handsome man walked right in to my life, kind of like he belonged there. After a couple of dates, I was still trying to figure it all out. I could barely get my mind around paint colours, let alone trying to imagine bringing someone else into the chaos that is my life at the moment. Shortly after our second date, before our third, we were talking on the phone and I spilled it all … poured my heart out as fast as the water tumbling over Niagara Falls. I told him that I wasn’t supposed to meet anyone right now because my life was too chaotic and I was thinking about leaving the country in the fall and I wasn’t really looking to date because I didn’t think I had time and who knew what kind of state I would be in each day coming home to a disaster of a house and I didn’t know how long I was going to be gone for because I was kind of thinking about living abroad, but I was trying to keep my plans ‘unplanned’ until all of the other pieces fell in place and I’d already started renovations but much more on the way and I’d be leaving soon for three weeks in South East Asia … and, and, and … Likely all in one run-on sentence just like that. Although my first goal was to become debt free, my second goal was to use my new found freedom to travel even more than I had before. What did I have to lose? No husband. No kids. No commitments. I certainly wasn’t looking for a man to come into my life and change all of that (nor was I opposed to it … just wasn’t looking for it). So, I figured I should be honest from the start and it all just came rushing out. He’s been adamant since the day I told him my plans that he did not want to influence my decisions to travel in the fall. Although I appreciate that, let’s be honest … when someone great walks into your life, as much as you try to keep your plans on track, there’s always a little wiggle room, right? All I know is that a few weeks after meeting, he’s managed to help keep me sane through work and renovation stress, balance me and de-stress me … he didn’t even ask if I was hiding something crazy at my house when I wouldn’t invite him over for weeks (due to the chaos in my home) … He’s made me laugh and he has put up with my obsessive hugging. If you’ve never seen my posts on Facebook or heard me talk about how much I LOVE hugs, you just simply cannot understand. Just because a nice man has come into my life doesn’t mean I’m going to give up my dream. On the flip side, just because I have a dream doesn’t mean I’m going to give up a good man. And besides people … it’s a little too early to tell what’s going to happen with either the man or my renovation / dream travel unplan. I don’t know, and I’m not really worrying about it at this point. I figure everything happens for a reason and eventually the reason will become clear. My plan hasn’t changed. I need to get debt free. And, I want to travel (lots). That’s as much of the plan as I was ever willing to commit to and that hasn’t changed. Except for renovations … they are definitely a nightmare. Renovations may be the death of me. Here we are in March and honestly, the renovations are only creeping along. I can’t believe I somehow thought they would be done by now. Who was I kidding? Between the contractor’s schedule and lack of communication and my need to do things on budget (hence asking friends to help), it seems like it is all moving at a snail’s pace. Oh yes, let’s not forget the incredible stress I’ve had trying to decide on paint colours for throughout the house. It’s really quite the disaster and I don’t know how I’m surviving. There is no livable space in my house. The kitchen has been torn apart for over a week with most of my dishes packed up and stored throughout the house. Drawers are filled with stuff and sitting on the living room floor, plates are covered with table cloths to keep the dust off. The wall paper has all been removed in the kitchen and the cabinet faces have been taken off site to paint. They’ve now been returned, the rest of the cabinets have been sanded and painted … Sadly, once the cabinet faces were put back up, they didn’t look right. After staring at them for days and having other friends look at them, I decided something was wrong. I talked to the contractor and it appears that he got two cans of white paint mixed up. He put the last coat on the cabinets with what he thought was semi gloss, but he ended up re-priming them. So, down they all come again to be repainted. Here goes at least another week without an operational kitchen. I haven’t cooked in a couple of weeks. 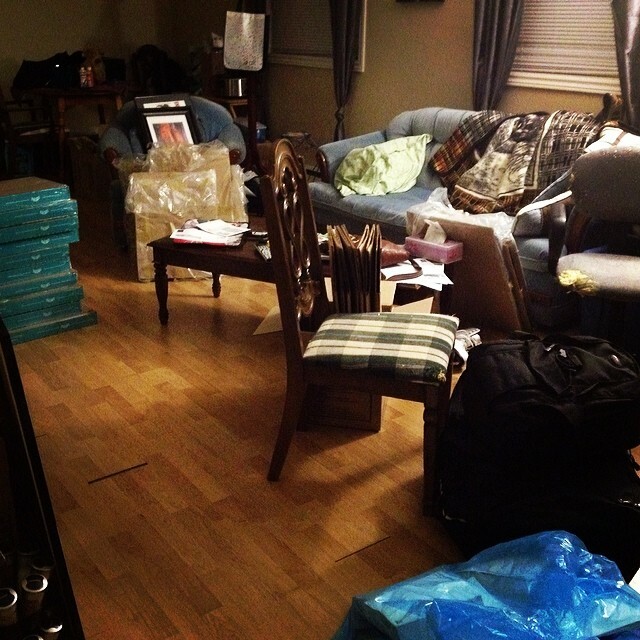 With everything from my kitchen now moved into my living room, it’s in quite the state as well. But, up until this point the living room has been untouched so there is still a couch to sit on, it’s just messy all around. As for upstairs … the furniture has been moved around a couple of times and both bedrooms and the hallway are painted with two coats of silver dollar half grey by Benjamin Moore. The trim has been painted, but a few spots have been missed and need touch ups. Sadly, the hallway was done horribly with some areas not getting even one coat and other areas being spotty. I had to ask the contractor to redo it, which he did. Sadly, I think the main reason was because of poor lighting in the hallway and he simply couldn’t see well enough to do a good job. A couple of days after mentioning it, the hallway has been redone, it looks much better. Phew! The floors are bare with the carpets gone and staples all removed, but no matter how many times I sweep or vacuum they are still filthy. All of the furniture from my master bedroom (except the bed) has been moved to my small spare bedroom. There’s room to open the door, but I don’t really bother because not much can be done in there. At least the painting in that room is done, other than touch ups, so I can just avoid that room all together. My bedroom on the other hand, I can not avoid. My bed still sits relatively in the middle of the room. 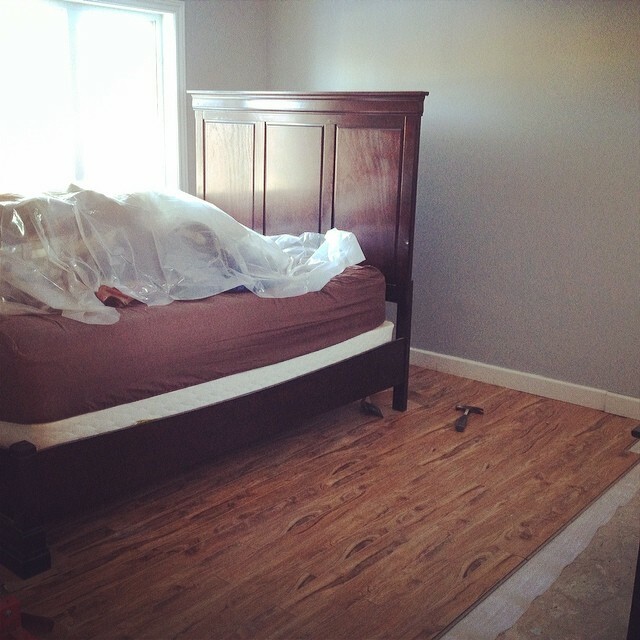 A friend is laying my new laminate floors for me (Molokai Driftwood). He started and with about 6 or so hours of work, has done a little more than half of my master bedroom. Good progress. Sadly, having a friend work on this means it is slow going. Not in the actual work, but more in the matter of he can’t come do it all at once because he has a full time job. So, it has to be between work and family commitments. Every day from the beginning of the contractors painting up stairs I’ve had to keep my bed covered in plastic and then uncover it each night before I go to bed. This continued once we started the flooring. I had to empty out my closet, which meant that everything got dumped on my bed then covered in plastic. Each night I’d come home, uncover everything, put it back in the closet so I could sleep on my bed and start it all over the next day. This was because I never knew which days the contractor or my friend were going to be coming to work on the bedroom and I didn’t want paint or dust all over my clothes. Bad enough it is all over EVERYTHING else! Oh the frustration! To add to the pressure? I only have a couple of weeks left before I leave for South East Asia and I definitely want my house on the market and able to be shown while I’m away. It’s useless for it to sit here empty while I’m gone. So, a hard deadline is in place. I leave early morning on April 1st. Thanks to my friends who have been helping out and my sister who has helped with more than I can even say. From moving furniture to cleaning out cupboards, cooking me meals and just keeping me sane … Thanks everyone. March 6th … signing off … still alive but not sure if I’m sane. Ok ok … I’m cheating a little bit on this post. Below you will find links to several of the blogs I wrote in February about renovations which was the next big step in this big ‘get debt free’ process. Good for me, they were already written and fit right in with this progression. Good for you, if you missed them the first time, here they are again!